We’ve seen model number SM-N935G appear in an import listing to confirm that an edge variant of the Galaxy Note 7 exists, and its similarity to the Galaxy S7 edge model number (SM-G935) confirms that it is indeed an edge variant of the upcoming Galaxy Note. At the same time, however, we’ve seen model numbers that seem to indicate one device for all customers worldwide as far back as March and even with a model number list under the Grace codename. Now, we’ve even seen a poster hinting that users will be able to “write on the edge of something great” — a dead giveaway as to the existence of the Galaxy Note 7 edge as the next Galaxy. All the evidence has suggested so far that the Galaxy Note 7 will indeed bear the edge, but a new leak suggests that Samsung may indeed have a flat, non-edge Galaxy Note 7 variant in the works. 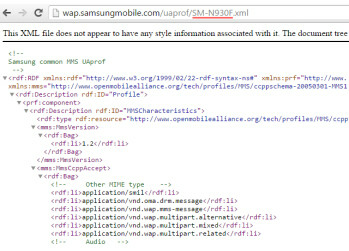 The model number SM-N930F has appeared on Samsung’s website with no details given regarding what to expect from the handset. We know from past and recent model numbers that the Galaxy Note 4 had model number SM-N910, the Galaxy Note 5 had model number SM-N920, so SM-N930 is a clear reference to the next Galaxy Note handset. Of course, until recently, we didn’t assume outright that the next Galaxy Note would skip “6” for “7,” but this is indeed the case. One interesting thing to note (see what I did there?) with the upcoming Galaxy Note is that the model number at Samsung’s website doesn’t bear the “G” at the end of it, suggesting that this could be a regular Galaxy Note 7, not a Galaxy Note 7 edge. And yet, at the same time, this may not necessarily indicate as much. Samsung has been unifying its product line to provide marketing clarity for consumers: the Galaxy S7, Galaxy S7 edge, and the upcoming Galaxy Note 7. To provide even more clarity with the Note line, Samsung may ditch the “edge” moniker for the Note this year so that every consumer will see one Galaxy Note 7 variant instead of two variants. News out of Korea reveals as much: that the dual-edge design has been chosen for the Galaxy Note 7, without a “tipping of the hat” or possibility of any non-edge variant arriving on the market this year. For now, then, we suggest that you take the possibility of a non-edge Galaxy Note 7 variant with a grain of salt. We’d rather you err on the side of caution than err on the side of surprise — until August 2nd, that is. Oh my gosh, at least this model number is really confirmed! I could care less about the gimmick edge display. Several people that I know have the Edge said the excitement if it wore off in a couple days. It seems that Samsung is so concerned about keeping up with icrap they have lost site of what set them apart from other devices. All glass..not a fan. Love my Note 1,2,3 and 4. Now those devices made Samsung tops..not making it shiny and pretty. I hope the Galaxy Note 7 will only have one real edge, just like the Galaxy Note edge I owned before my S6 edge, S6 edge plus and my S7 edge. I really miss the SPen and the real edge since I don’t have got the Note edge anymore. The edge on the Note edge was very useful in comparison to the S6 edge and S7 edge. I think Samsung will publish a flat Version for sure, too. They should know, that there are many People, who don’t like edges on a phone. I thought that the “F” in the part number designated the Europe model. Actually the “F” designation at the end of the model number designates that it is a Snapdragon device. I do hope that Samsung will also release an Exynos variant too. The F stands for international version and that is most likely the Exynos variant. As it doesn’t have to support CDMA bands. if that is the case, then I am going for s7 edge, because I like the edge variant. But it does not say if it’s called Note 6 or Note 7. Why has Samsung skipped 6? Samsung has skipped “6” because of the clash with the Galaxy S7 and Galaxy S7 edge. To keep the number the same and not confuse consumers, Samsung has opted for “7” as the next number in the Note series. Personally, I don’t find it confusing at all. Considering when the original Samsung Galaxy S was released the technology wasn’t available to create the Note series to begin with. Suits me just fine. I’ve got the Note 4. Previously I had the original Note. I can only justify to the spouse upgrading on every third model number. Bring on the Note 7! So why the sudden change. Does Samsung think were are all Dumb People and they are the intelligent ones? I don’t care what they call it, just so long as it’s flat.